TechPowerUp reveals photos and features of the upcoming MSI Big Bang XPower II X79 mainboard, you can check it out over here. Enter the MSI Big Bang XPower II, the company's top-tier socket LGA2011 motherboard for enthusiasts. This board is designed in the XL-ATX form-factor, and will fit in cases with at least 10 expansion slot bays. Thanks to the added board area, it's able to accommodate both a strong VRM, and high room for expansion (with eight DDR3 memory slots and seven PCI-Express slots). To begin with, the LGA2011 socket is powered by a 24-phase VRM that makes use of driver-MOSFETs, solid-chokes, and High-C POSCAP capacitors. The memory is powered by a 4-phase VRM. 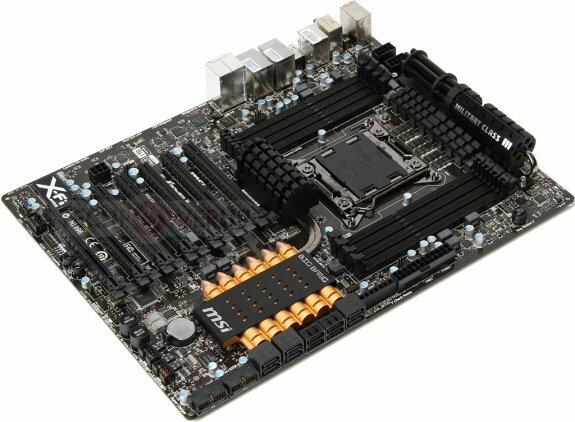 The board draws power, apart from the 24-pin ATX, from two 8-pin EPS connectors, and an optional 6-pin PCIe (to stabilize PCIe slot power delivery). We can see many accessories to this VRM, such as phase-loading LEDs, and consolidated voltage measurement points. We are particularly intrigued by the design of the heatsinks over the VRM and chipset. The one over the VRM looks like the barrels of a Gatling gun, while the one over the chipset looks like a small piece from an ammo belt. You will either love it or detest it.